The next generation of the long-running Online Learning Survey is here, and it is now called Digital Learning Compass. Originally known as the Sloan Survey of Online Learning, then known as the Online Learning Survey, this study led by Jeff Seaman and Elaine Allen from the Babson Survey Research Group (BSRG) has been the definitive source for understanding the state of online learning for higher education in the United States since 2003. Three years ago the Department of Education's Integrated Postsecondary Data System (IPEDS) started releasing census-based data on online enrollments, starting with the Fall 2012 term. 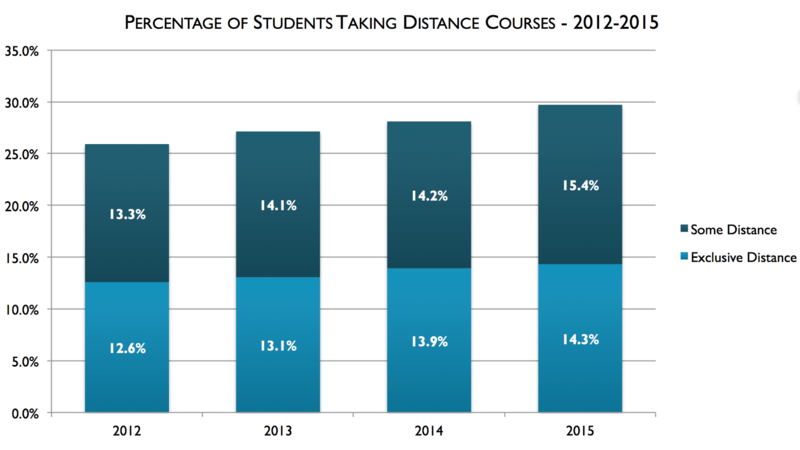 The most recent data set is from Fall 2015, and today's release of the Digital Learning Compass: Distance Education Enrollment Report covers this new data. Download the full report for free here. A year-to- year increase of 226,375 distance education students, a 3.9 percent increase, up over rates recorded the previous two years. The total of 6 million for fall 2015 distance education students is composed of 2.9 million taking all of their courses at a distance and 3.1 million taking some, but not all, distance courses. Public institutions command the largest portion of distance education students, with 67.8 percent of all distance students. Large enrollment drops among for-profit institutions were driven by a few of the largest institutions; the majority of for-profits grew their distance enrollments. The number of students studying on a campus has dropped by almost one million (931,317) between 2012 and 2015.
e-Literate, where we have created summary tables in Tableau Public showing DE enrollment by sector, by state, by geographic view, and by top DE enrollments institutions. This year we have created the Digital Learning Compass partnership between our three groups. While we have collaborated in the background in previous years, all three groups felt that we could do better by formalizing this relationship and making it easier for folks to have one place to find the joint reports and additional analysis. We at e-Literate are excited to participate in this partnership, and we thank Pearson and OLC as long-time sponsors of BSRG work that are continuing to sponsor the new work. One of the changes from previous years is that we plan on various updates and specialized reports throughout the year. Expect to see more from us soon. Hi Phil- thanks for the new report. I’d welcome your view on a related issue I’ve been wrestling with, namely how to treat for-profit institutions with significant numbers of online students that are now nonprofit. A number made such a conversion in the fall 2012-15 period, and more are to come (e.g. the EDMC and Kaplan announcements). In your study, did you use institutional control for the year concerned or continue to treat former for-profits as such? If the former, then I think it is worth pointing out that some of the private nonprofit growth, and for-profit decline, is due to control conversion. Richard – that is a good point, and you are correct that the current data used institutional control for the year concerned. The plan is for us to address in separate blog post and possibly further analysis report.